We often celebrate the bond between a man (or woman) and their dog, but this story of a cat taken in by a family and their Huskies, who now acts like one of the gang shows the relationship between a dog and cat isn't perhaps as complex as we sometimes believe. 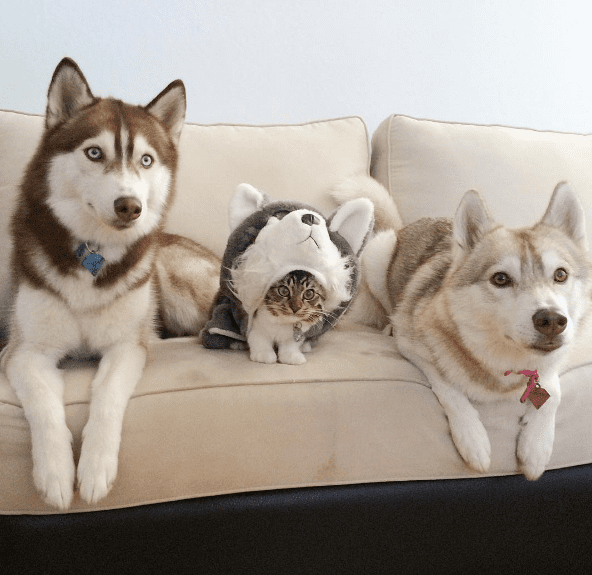 To celebrate International Cat Day, we're bringing you the story of Rosie, the kitten and Siberian Husky pals, Lilo and Infinity. In August 2015, Lilo became a surrogate mother to her family's new foster, little Rosie. When she arrived, Rosie was lethargic and unresponsive after the first night and so Lilo took over to give comfort. Lilo's owner says, "She has always had an innate motherly instinct, but she really surprised us when she went full surrogate mode! Even letting Rosie suckle on her and stimulating her to eliminate! Lilo has never had puppies of her own, and never will. But motherhood may just be her calling." As Rosie recovered, grew and gained in confidence, thanks to Lilo's nurturing, she soon became one of the gang joining them on walks. And also joins the family on their hikes. Lilo and Rosie's owner says, "Since the beginning, Rosie has grown up thinking she was a husky. She does everything that the doggies do and the best part is that they don't see what we see, they have no idea that they aren't supposed to be friends or that they are different. Rosie has definitely become an essential part of our pack." And it seems Rosie hasn't finished learning from Lilo as she has become a foster carer to a litter of kittens herself. Follow Rosie, Lilo and Infinity's journey and ongoing adventures on Instagram @lilothehusky, Facebook @Lilothehusky or Youtube @Lilothehusky.